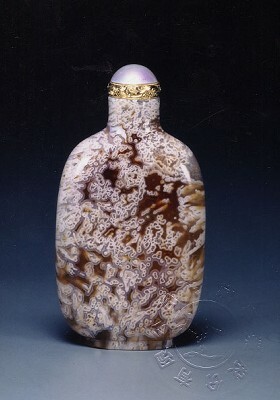 This snuff bottle is made of coral, Qian Long period, nearly 400 years till now. Miscellaneous antique includes arts of rare ornaments carved in ivory, tortoise-shell, and rhinoceros-horn. Hou-han-shu (Post-Han History) Si-yu Ta-ch' in-kuo Chuan records: "Ivory, rhinoceros-horns, and tortoise-shells are contributed." It is hardly difficult to notice that Chinese were fond of these rare treasures in the Han period. Ivory is hard enough to be carved into extremely thin design without breaking. The supreme technique was to carve the whole ornament in openwork without the assistance of glue. A set of concentric ivory balls in openwork, ingeniously carved in a skill similar to Kuan-tung technique, was highly praised as "kuei-kung"(prodigious workmanship). Carved ivory usually took the forms of statues, brush holders, small screens, armrests, ju-is (a king of scepter, symbol of Buddha), snuff bottles, perfume bottles, vanity cases, etc. During the Ching period, many of carved ivory exported to Western countries. Consequently, ivory balls, turreted boots, palaces, and chess were produced catering to Western taste. The belt hook introduced in this book is a petite ornament. However, the larger ornament often needs to submit to the curved shape of tusks. Observing the hallstand, the paired bottle, and other ornaments, we will comprehend that difficult technique and pursuit of beauty consist of the characteristics of ivory carving. Chinese considered the rhinoceros as a rare animal; hence the rhinoceros-horn was also regarded as precious. "The Rites of the Chou" records, "Those who can not use jade should search for rhinoceros-horns". In general, artisans carved cups, pipes, hairpins, and plates depending on the shape of the hone. Apart from delicacy, rustic flavor composes of the attributes of carved rhinoceros-horn. Tai-mei is a kind of tortoise inhabited in the South Seas. Its brownish-yellow shell with black spots reveals a special beauty which Chinese literary men were never tired to sing and praise. Furthermore, tortoise-shell was carved into ornaments such as hairpins and combs, even large furniture e.g. tortoise-shell beds. We especially recommend three elaborate and refined fan, vessel, and case carved in tortoise-shell. "Hwai-nan-thz Tai-tzu-hsun" says, "Everything is encompassed by Heaven and earth, generated by Yin-yang, and moistened by rain and dew. Jade, pearl, feits'ui, and tortoise are colorful, bright, and glossy as if moistened." From this passage we witness how tortoise was adorned. In addition to carved ivory, rhinoceros-horn, and tortoise-shell, this section includes a flower pot and snuff bottle made in Tuan stone. Tuan stone, located in Tuan-his Village, Kao-yao County, Kuang-tung Province, was the best material for making inkstone. Though literary men cherished Tuan-his inkstone most, the flower pot and snuff bottle made in Tuan stone are rare to see.